I couldn’t believe that anybody else could have the same story as me is the title of the exhibition by Iratxe Jaio and Klaas van Gorkum at the Uhagon Kulturgunea of Markina. This phrase, drawn from the reflections of Camilla, a woman with South Korean origins adopted by Danish parents, on her childhood memories as a different girl, reveals how identity -taken here to its most narcissist and infantile extreme- is constructed from the notion of Difference and the confrontation with the Other. But, why talk nowadays about what Fredric Jameson calls the “objective mirage”? Hasn’t everything already been said about this subject which, and not only in our own surroundings, has taken on such exaggerated proportions and so much self-complacency? The front pages of the newspapers are clear: Open borders and cars burning in the urban peripheries, macro court cases and international conventions that stage the “alliance of civilizations”… The discourses about belonging and collective subjectivity are still in the centre of the discussions. In a multicultural world where, more than between the distinct collective subjects, tension originates from the relation between the individual and collective subject itself, and from within the latter as a notion that resists monolithic and consensual categorizations, identity occurs as a dynamic and instable construction. Throughout their individual and collaborative work, Jaio and van Gorkum made this tension the object of their analysis, applying documentary methods with anthropological aptitude to generate narration. The fiction, in this case in the form of a confession, accompanies this project in all its stages, changing in format and medium depending on its context. The life of ‘Camilla’ started in 2004 with the project Flyer Project Seoul – This Is Not A Love Letter, in the form of a flyer distributed inside the newspapers of Seoul. The story of a woman of Korean origins whose appearance exposes an identity she doesn’t identify with, speaks about the difficulties in reconciling individual identity with other people’s expectations. And it does it specifically in the location, in Korea, where the ethnic characteristic that renders the main character ‘exotic’ in her own environment, Denmark, is dissolved into the indistinct. After occupying the space of Ad Hoc in Mugalari in April, this project reaches the exhibition space of Uhagon Kulturgunea, in the form of a documentary installation that reveals the production processes, distribution channels and the consumption of images, as links in an ideologically loaded chain. In the first projection there is a sequence from the album of childhood and adolescence photo’s, of an oriental Camilla surrounded by blond people; in the second, next to a display case with the newspaper intervention Ad Hoc, a registration of the printing process of the Gara newspaper. When bringing the narration of Camilla to the Basque context, Jaio and van Gorkum were conscious that the story was going to resonate here in a different, but equally powerful way. This is not because of a rise in the adoptions of oriental girls, although it is true that this phenomenon is contributing to the change in the usually monotonous, Basque human scenery. The reasons are different: partly because identity – confronted with the ‘other’ dominant one - has always been ‘the big question’, central to what we know by ‘the conflict’ or ‘the Basque issue’. Consequently, in the last forty years many discourses (political, institutional, cultural, mediatic, linguistic…) have already been articulated around this extensive consciousness. On the other hand, in the last eight years, coinciding with the truce of ETA and the opening of the Guggenheim Museum in Bilbao, a situation of ‘maturity’ has come about in the way an identity in conflict is experienced, which Txomin Badiola summarised as: “it’s time to use the Basque flag in the same way as Jasper Johns used the American flag: with irony and lack of sentimentality”. 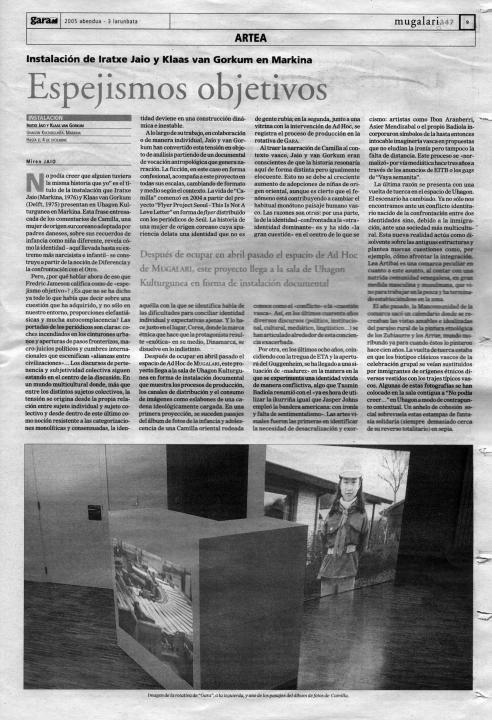 It was in the visual arts where the necessity of desacralisation and exorcism was first identified: artists like Ibon Aranberri, Asier Mendizabal or Txomin Badiola himself, incorporate symbols of the, up until then untouchable, Basque imaginary, into proposals that were not eluding irony nor lack of distance. This process was ‘normalized’ within the media three years ago, accompanied by commercials on EITB (basque TV) and the gags of TV program ‘Vaya semanita’. The final reason presents itself with a twist in the space of Uhagon. The scenery has changed. We do not just find ourselves before a conflict born from the confrontation between two identities anymore, but also, thanks to immigration, before a more multicultural society. This new reality acts as a solvent of old structures and raises new issues, such as how to deal with integration. Lea Artibai is a peculiar region in relation to this issue, because it nourishes large Senegalese community, mainly masculine and muslim, that came to work in the fishing industry and ended up establishing itself in the area. Last year, the local regional council published a calendar, recreating the pleasant and idealized rural landscapes from the ethnological paintings of Zubiaurre and Arrue, from a world that was already in agony when it was painted a hundred years ago. The twist is that the classical biotypes of group celebrations are substituted by immigrants of different ethnic origins, who are dressed up in the typical Basque costumes. Some of these photographs were displayed in Uhagon in the adjoining room to “I couldn’t believe…” as a contextual counterpoint. A yearning for social cohesion hovers over these printed fantasies of solidarity (which is never far from its totalitarian reverse) in sepia.